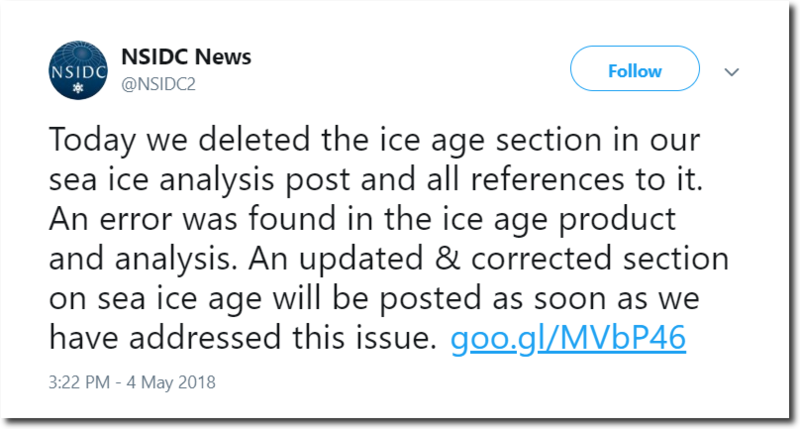 In their ongoing efforts to misinform the public about the non-demise of Arctic sea ice, NSIDC “forgot” to advance the age of the ice in week 37 last year – until they got called out on it. Note: The ice age fields originally posted on Thursday, May 3, were incorrect. The ice age field has its “birthday” each September after the minimum, when all of the age values are incremented by one after the end of the summer melt season. For example, first-year ice becomes second-year ice after the minimum, second-year ice becomes third-year ice, and so on. However, in the original post, the near-real-time age fields were not incremented after the 2017 minimum. The animation below shows how they normally add one year on to the age of the ice in week 37. They are doing the exact same cheating again this year, forgetting about the ice’s birthday in week 37. There should have been a large change in the colors of the map in week 37. I fixed it for them in the image below. This is what week 37 should look like. Note that one year from now, there will be lots of red five year old ice. 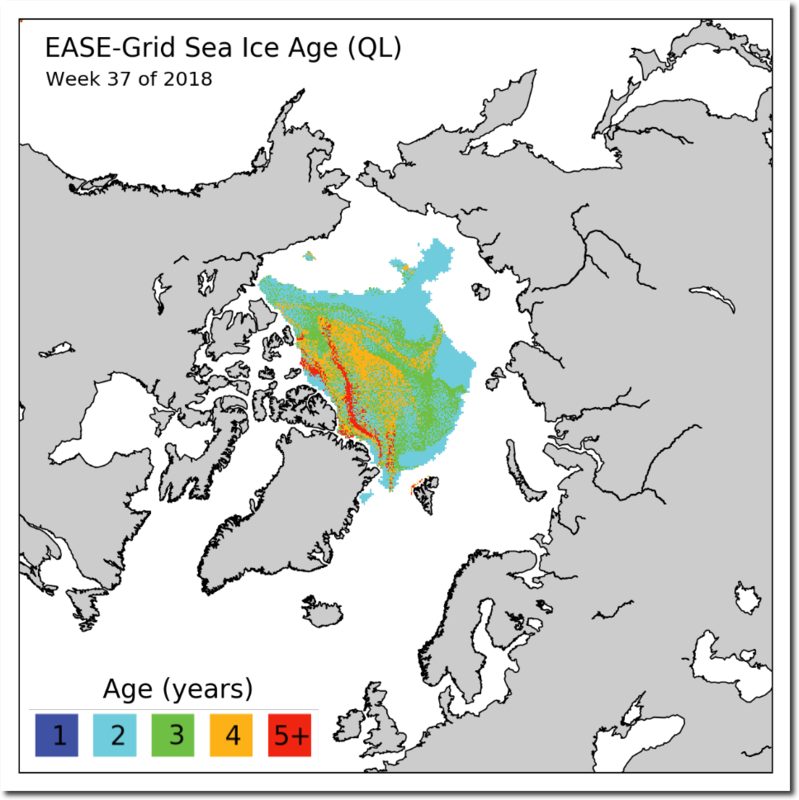 Nine years after experts announced the disappearance of multi-year ice, there is lots of multi-year ice in the Arctic. It looks like the Arctic temperature plunge (DMI surface 80N) has resumed after the unsual warmth, I know Griff was terribly worried about the slow refreezing! JoNova has a bit on the ‘genius’ of the Arctic climate models – they cover everything from 0-95% ice extent minimum retention by 2100. It was probably unwise to leave everything above 95% – they will still be proven wrong I’d guess! Doesn’t look like they changed anything – yet. I don’t think Tony has the full story here. NSIDC is just trying to follow the world wide culturally accepted norm of observing Leap Year, but has decided to honor it by leaping over in mid-September instead of February; which just happens to coincide with the day that NSIDC annually adjusts the age of the ice. It was deemed culturally insensitive by the IPCC to always have Leap Year coincide with Winter in the more industrialized Northern Hemisphere, as the Earth has two Hemispheres. In addition, the NSIDC Leap Year adjustment is done by computer algorithm, so as to preclude any human cognitive biases. There is a New York Times article that explains it all, I just need to find the link. What is northern hemisphere bias? Put simply, “Northern Bias” is an example of Arrogance on the part of people who live above the Equator. In our literature, our news reports, and even our day-to-day thinking. While you are looking for the scientific explanation of Northern oppression in the New York Times archive, the following lecture should enlighten the readership. The current maps denigrate Islam, The Prophet (peace be upon Him) and His people. We don’t hear much about Cryosat 2 that was launched in 2011 as ESA Earth Explorer mission. It covers much of what you are saying Tony, as it also estimates volume. I worked on GOCE so seeing Cryosat 1 not get to orbit on the Rockot system was interesting at the time. GOCE was next to be launched. 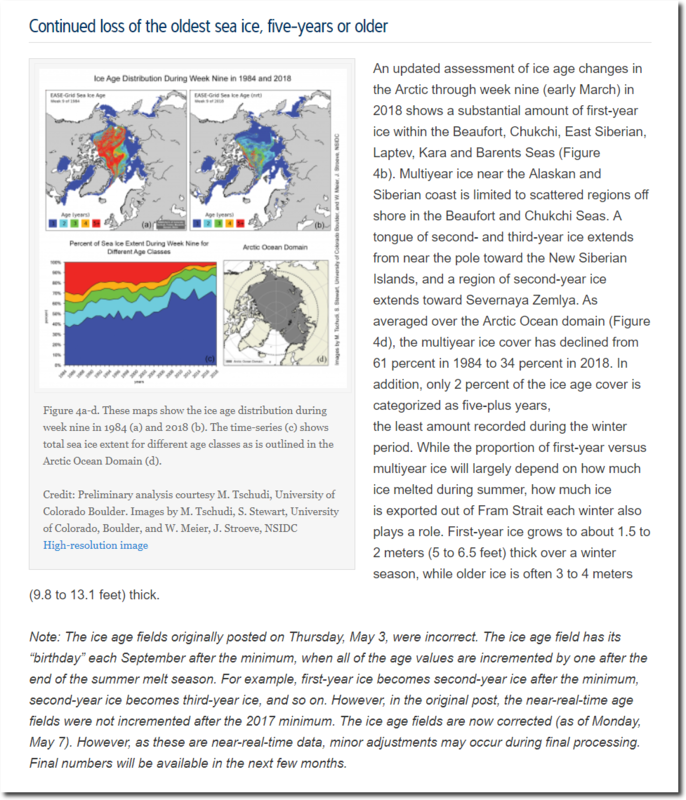 OT, but NSIDC posted a page 3 days ago about the SMB and Melt on Greenland Ice sheet. Does not look like a bumper south Greenland barley harvest for the Vikings this year. Does not look like a very good south Greenland barley harvest for the Vikings this year. Maybe Tony can ride his bike over to NSIDC and have a chat with Mark S. about this issue. Well, maybe. But being that he’s now in Aridzona, that’s down the road a pretty fur piece. Not according to you back when there was more. But never mind, the wind and waves are what did it in and not CO2.